You may bring print and/or digital images. Normally there will be a Set Subject listed in the programme and this will be followed by an Open Section for images of any subject matter. Prints must be accompanied by a digital version to be projected for the audience to view whilst the prints are being assessed by the commentators. You may bring a maximum of two images these may be either prints (accompanied by a digital version), Digital Projected Images (DPI’s) or any combination of the two. If there are too many images to show in the time available images from the Open Section may not be shown. PLEASE NOTE THAT ALL DIGITAL IMAGES MUST BE SENT VIA EMAIL BY 6pm ON THE PREVIOUS DAY AT THE LATEST OR BROUGHT ON THE EVENING. Images must be jpeg format 1600 pixels maximum width and/or 1200 pixels maximum height if in portrait mode. Please make the effort to take images specifically for the evening theme and not just trawl through your back catalogue for 'something that may do'. Images should be saved with the best colour profile for digital projection (sRGB). To ensure it is in the sRGB space use "Edit | Convert to profile.." and see what profile is listed in "Source Space". 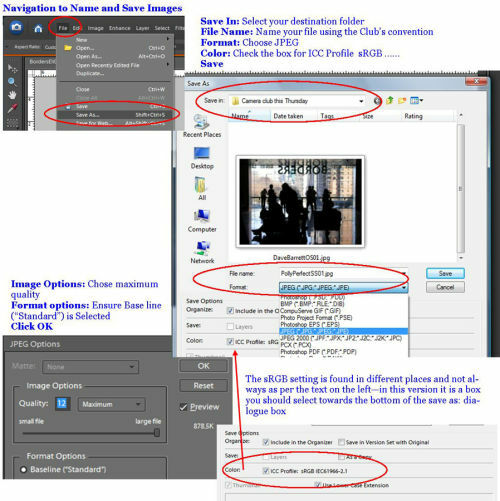 If it is not an sRGB colour space, you will need to choose an sRGB colour space from the profile drop-down box under "Destination Space". Click OK and it's done! You should do this before saving the file as a JPEG. If you don't, you will have to resave the file, which is not the best thing to do due to possible image degradation from repeated saving in the JPEG format. Please make sure that you keep your original image by saving your new image size as "Save As" with a different title.